At the 2016 Consumer Electronics Show (CES), Ford unveiled its latest infotainment interface  Sync 3. After a year of waiting, it finally makes its way to India in the Ford Endeavour. Ford says it will initially be available on the top-spec Titanium variants, which means it could eventually trickle down to the lower Trend trim. Sync 3 brings with it Android Auto and Apple CarPlay compatibility and an updated AppLink interface. It also features a new 8-inch capacitive touchscreen. This means the screen will be a lot more responsive and you'll have features like pinch-to-zoom. The touch sensitivity will be more like a modern smartphone's screen, and you won't have to use your nails to navigate through the menus. 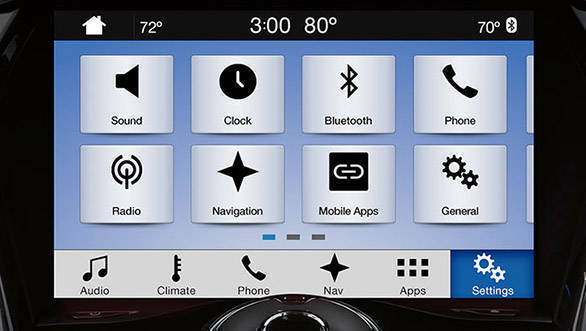 Ford also says that the new system is faster and more responsive to voice commands. Like the previous Sync interfaces, Sync 3 also gets Ford's Emergency Assistance feature. If the airbags are deployed in the event of a crash, the system automatically calls emergency services from the paired phone. The Ford Endeavour is offered with two engine options  a 2.2-litre turbodiesel and a 3.2-litre turbodiesel. The 2.2-litre engine, which produces 160PS and 385Nm, can be optioned with either a 6-speed manual or a 6-speed automatic transmission. The 3.2-litre variant, producing 200PS and 470Nm, is offered with just a 6-speed automatic. Both the engine options are offered in Trend and Titanium trims. However, the 2.2-litre Titanium variant doesn't get the option for a manual gearbox.